Thank you to everyone that came and showed their support on the Open Day on Saturday 2nd April. 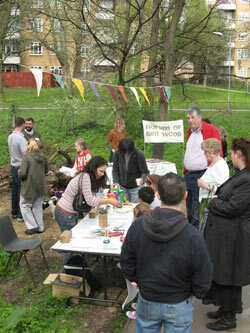 The Friends of Dog Kennel Hill Wood had a stall with information about their activities. Lots of people had views to express about the work in the wood and many people were concerned that the area should be managed to the benefit of wildlife. Fourteen new members signed up in the 2 hours that we were there – hopefully news about us will spread. Interested people can always contact us to join. 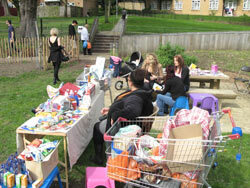 We also managed to raise some much-needed funds through selling cakes and Luckybird wildlife cards. Lots of children took part in the activities that we had prepared: woodland log books and spring hunts. Several people tooks some of these to do at a later date. Hopefully this means people will start to appreciate the wood and notice the importance of the wildlife there. Pippa Krishnan, the Cleaner Greener Safer project manager from Southwark council was also there to hand out snacks and “pooters”. The children loved these and seemed to find a lot of woodlice! Sandra from Champion Hill Estate had a tombola. 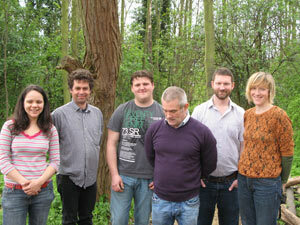 Councillor Veronica Ward also came, as did Stephen Charles who has been carrying out the work in the wood.